Model: VQ163R. This 3D glasses have a simple and classic appearance. Polarized lens to reduce glare and increase picture clarity. 1 Pair of 3D Glasses. Lightweight and give you a high-quality 3D picture. 3D Glasses Black Circular Polarized Passive 3D Stereo Glasses For TV Real 3D Cinemas. Item Type: Circular Polarized Passive 3D glasses. 3D glasses support Polarized 3D TV and Real D cinema. Polarized lens design eliminates the red / blue look for a more chic and classy style. Polarized Passive Glasses generally can be used on TV / cinema / computer / and so on. Item Type: Circular Polarized Passive 3D glasses. This glasses are only suitable for devices with polarized 3D function. However, ordinary TV can not be used, carefully before you buy it! Bring your movies to life with these Passive 3D Glasses. Used when fishing or as the sun glasses, filter effect is very well. No power source is required, you'll never have to worry about recharging these great accessories! This 3D Passive 3D glasses support Polarized 3D TV and Real D cinema. Free from signal and wave interference. It's light and economical. 1 Passive 3D Glasses. Compatible 3D TV Models. For LG: new 2012 model LM3400 series, LM6200 series. Type: Polarized Passive 3D glasses. This 3D glasses have a beautiful appearance. Polarized lens to reduce glare and increase picture clarity. 10 Pair of Passive 3D Glasses. These glasses don't protect your eyes from ultraviolet light. Not for Active shutter 3D TV. Passive circular polarized ;. This is Kids size 3D GLASS Fit for all Passive type 3D TV and blue-ray DVD. This realD 3D glass creates a crystal clear image with reduced ghosting effects. Clip-on 3D Glasses suit for: VIZIO LG, VIEWSONIC and other Passive Type 3D TV. Clip-on 3D Glasses suit for: Passive 3D TV, 3D IMAX Theatre; 3D Blu-ray DVD. This is original new 3D GLASS clip With the 0.72mm thick Glass lens. Passive circular polarized ;. The Qty is 2 Pairs LG Kids 3D Glass. This is suit for kids size 3D glass. This 3D GLASS Just for Kids size. This 3D Passive 3D glasses support Polarized 3D TV and Real D cinema. Free from signal and wave interference. It's light and economical. 1 Passive 3D Glasses. Compatible 3D TV Models. 55LW9800, 65LW6500, 60PZ850, 47LW5700, 55LW5700, 47LW5600, 55LW5600, 47LW6500, 55LW6500, 47LW5300, 55LW5300, 42LW5300, 55LM7600, 47LM7600, 55LM6700, 47LM6700, 65LM6200, 55LM6200, 47LM6200, 42LM6200. 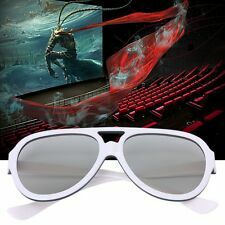 This 3D Passive 3D glasses support Polarized 3D TV and Real D cinema. Free from signal and wave interference. It's light and economical. Compatible 3D TV Models. 100 Passive 3D Glasses. Your coming creates wonderful life！. This 3D Passive 3D glasses support Polarized 3D TV and Real D cinema. Free from signal and wave interference. It's light and economical. 1 Passive 3D Glasses. Compatible 3D TV Models. 21 6.5 0.1cm / 8.27 2.56 0.04in. Trending at $1.58eBay determines this price through a machine learned model of the product's sale prices within the last 90 days. This 3D Passive 3D glasses support Polarized 3D TV and Real D cinema. Free from signal and wave interference. It's light and economical. Compatible 3D TV Models. 1 Passive 3D Glasses. For LG: new 2012 model LM3400 series, LM6200 series. Model: C02CP. This 3D Passive glasses support Polarized 3D TV and Real D cinema. Free from signal and wave interference. It's light and economical. Type: Polarized Passive 3D glasses. Confirm your TV is Polarized 3D TV and 3D TV format before purchasing the 3D glasses. This 3D Passive 3D glasses support Polarized 3D TV and Real D cinema. Free from signal and wave interference. It's light and economical. Compatible 3D TV Models. 1 Passive 3D Glasses. 21 6.5 0.1cm / 8.27 2.56 0.04in. Model: G90. Type: Polarized Passive 3D glasses. This 3D glasses have a beautiful appearance. Polarized lens to reduce glare and increase picture clarity. 1 Pair of Passive 3D Glasses. These glasses don't protect your eyes from ultraviolet light. This 3D glasses have a beautiful appearance. Type: Polarized Passive 3D glasses. Polarized lens to reduce glare and increase picture clarity. 1 Pair of Passive 3D Glasses 2. (2 Pairof Passive 3D Glasses ).